Not all Physalis species bear edible fruit. 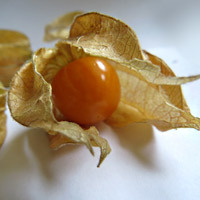 Select species are cultivated for their edible fruit, however; the typical Physalis fruit is similar to a firm tomato in texture, and like strawberries or pineapple in flavor, with a mild acidity. In Chinese medicine, Physalis species are used to treat such conditions as abscesses, coughs, fevers, and sore throat. 100 grams of fruit contain about 130 calories. The fruit of the Physalis has a high content of cryptoxanthin or vitamin A. It is used very much in confectionery for the decoration of cakes, puddings, creams and mints, as well as in fruit salads. It can be added to jams and marmalades, as well as to be dried like figs, grapes and apricots.